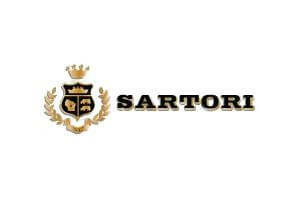 Sartori is a 4th-generation family owned and operated company. Paolo Sartori came to America to achieve his American Dream, starting in 1939 when he started the company S&R Cheese Corp. in Plymouth, Wisconsin, together with co-founder Louis Rossini. In 1953 Joe Sartori and Leonard Gentine, nextdoor neighbors, founded Sargento, but Joe later sold his interest and continued with S&R which changed to Sartori ten years after son Jim took over the rains. Today Sartori has an impressive collection of gourmet cheese and an even more impressive collection of awards; over 100 awards, medals and ribbons at the most competitive and prestigious cheese contests and competitions around the globe. SarVecchio Parmesan Cheese is the most decorated Parmesan made in America. A Sartori-family original, this gourmet cheese is a multiple award winner; Merlot BellaVitano, a unique Cheddar-Parmesan inspired Italian farmstead cow's cheese immersed in fine Merlot wine to give it extra tang and a delicious merlot flavor. The combination of the fine wine and the rich and creamy Reserve BellaVitano is a wonderful end result that you will enjoy. Merlot BellaVitano cheese tastes delicious with dried nuts and fruits, crusty Italian or French bread. Try pairing the cheese with wines such as Shiraz, Merlot and Pinot Noir. You can also pair India pale ale, hoppy pilsners or wheat beers with the cheese for a great combination.